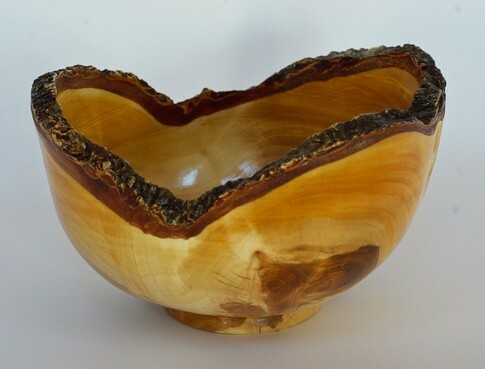 Natural edge bowls (sometimes called "bark edge" or "live edge" bowls) are inside out, as it were, with the base coming from the middle of the log and the rim of the bowl tracing a line along the outer edge of the tree. Because the outer surface of the log isn't flat, the rim rises and dips, and the resulting shape is oval rather than circular. 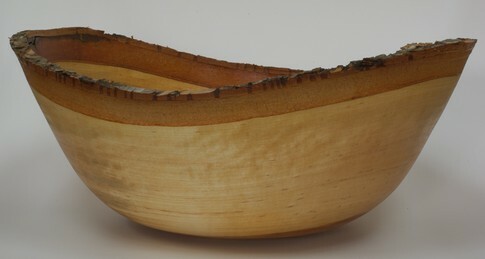 It can be challenging to keep the bark attached to the bowl; as the walls get thinner, the rotation of the lathe sets up vibrations in the wood, and it flexes as it spins. As often as not, the tip of the gouge will dig in just a little deeper, and the extra force this places on the wood can exceed the strength of the bond holding the bark to the sapwood. The end result, however, is worth the extra effort and care needed. Here are some of the natural edge bowls I've made. Above and right: natural edge bowls made of Cherry. 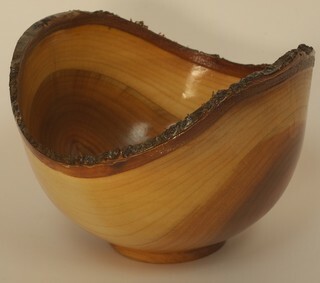 Below: natural edge bowl made of Silver Birch.